Support the gardeners in your life - and all the herbs, fruits, vegetables and flowers they bring to your life - by taking care of their hands and skin! Our Gardeners soaps are made with our Shea Butter and Cocoa Butter recipe, with stoneground cornmeal grits added for removing garden dirt, grime, sprays and oils. We offer a variety of wonderful garden scents including tomato vine, cottage rose, basil-lime and unscented. The shea butter and cocoa butter in the soap really help restore the natural skin oils that garden dirt and frequent hand washing removes. Many gardeners have to endure dry skin that is nicked with cuts, and hands that are sore at the end of a day in the garden. Our moisturizing shea butter recipe helps to heal and revive tired hands of all gardeners. All Gardener's Soaps are colored some shade of green by the Comfrey leaves, and flecks of ground herbs can be seen throughout most bars. We use no artificial colorants, so the various shades of green you see in our soaps reflect the miracle of Nature - just as our gardens do! Our Gift for Gardeners' Soap Six Pack includes six soaps to clean and care for a Gardener's hands, including Basil Lime, Cottage Rose, Cucumber, Lavender, Peppermint Lemongrass, and Tomato Vine. Our fresh from the garden Cucumber Hand Repair soap is made in our shea butter and cocoa butter hand soap recipe, with stoneground cornmeal grits for removing grime and oil, and scented with Rose. This Unscented Gardener's soap is made with stoneground cornmeal grits for removing garden dirt, grime, sprays and oil, and is fragrance free. This soap is made with stoneground cornmeal grits for removing grime and oil, and scented with Tomato Vine and Sweet Pea fragrances. Gardener's Gift Soap Trio. Three hand repair soaps to clean and care for a Gardener's hands, select from Basil Lime, Cottage Rose, Cucumber, Lavender, Patchouli, Peppermint Lemongrass, Tomato Vine, and Unscented scents. This shea butter hand repair soap for gardeners is made with stoneground cornmeal grits for cleaning grime and oil from hands, and scented with Bay Rum. This Gardener's soap is made with stoneground cornmeal grits for removing garden dirt, grime, sprays and oil, and scented with an old-fashioned rose fragrance. 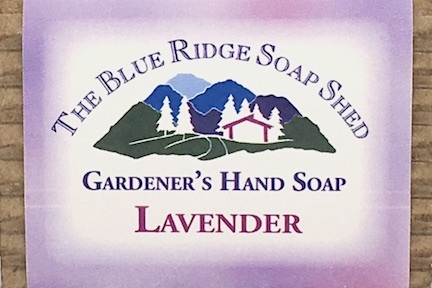 Lavender Gardener's Hand Repair Soap is our hand soap made with shea butter and cocoa butter recipe soap made with 100% natural Lavender Essential Oil. This gardener's soap is made with stoneground cornmeal grits for removing garden dirt, grime and oil, and scented with Basil Lime.